Kemptville District Hospital has been awarded Accreditation Canada’s highest ranking, “Accreditation with Exemplary Standing”, a measure of the quality of care and services it provides. 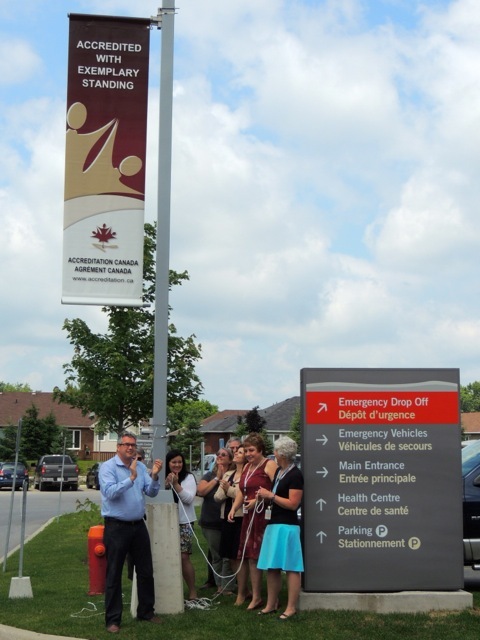 MAY 6, 2013 – Already rated the best small hospital in Ontario by both patients and staff, Kemptville District Hospital (KDH) now joins an elite group of Canadian hospitals awarded Exemplary Standing, the highest ranking possible under the rating system. The accreditation process is a third-party assessment of the quality of care and services provided, measured against best practices. KDH achieved Exemplary Standing after Accreditation Canada measured its performance against some 1,369 criteria across 11 sets of standards. The Accreditation Canada team was onsite at KDH in November 2012 and provided its final decision and report April 22, 2013. Kemptville District Hospital is a fully accredited healthcare facility committed to building healthier communities. We are distinct within the provincial health system as a model of hospital-led integrated health services. We operate on two sites and provide primary care management services, acute care hospital services, advanced orthopaedic care and pride ourselves on being a good partner within the system. Kemptville Hospital consistently ranks among the top hospitals in Ontario for both patient and employee satisfaction.